Illustration of Dublin, Ireland looking west along the River Liffey and showing the positions held by the Irish rebels. North of the Liffey, the General Post Office, headquarters of the rebellion, and Liberty Hall, from which the rebels had started on April 24, are in flames, bombarded by British forces. South of the River, forces led by Countess Markiewicz held St. Stephen's Green under fire from soldiers in the Shelbourne Hotel. Kilmainham Goal, where the captured rebels would be held, and where their leaders would be executed, is in the distance. 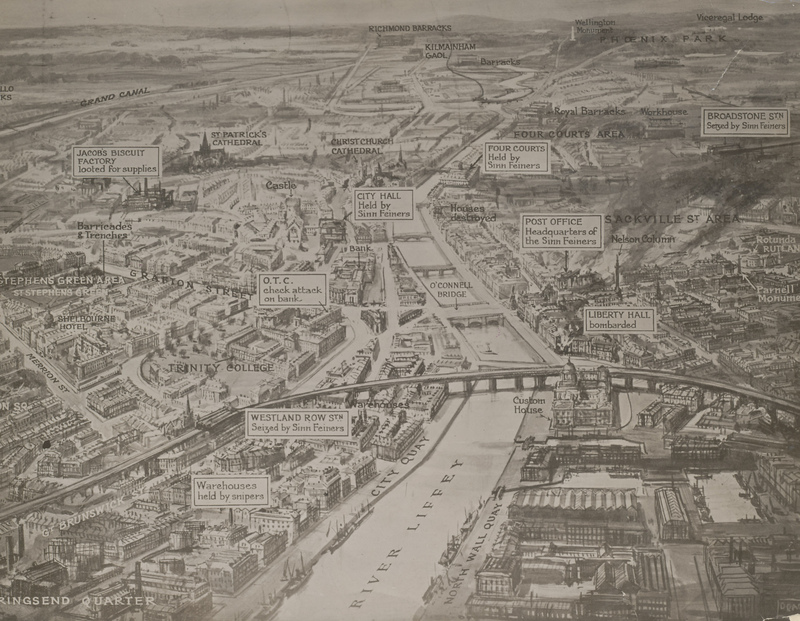 Overhead view of Dublin, looking westward up the River Liffey, showing the positions held by Sinn Feiners during struggle with British forces. 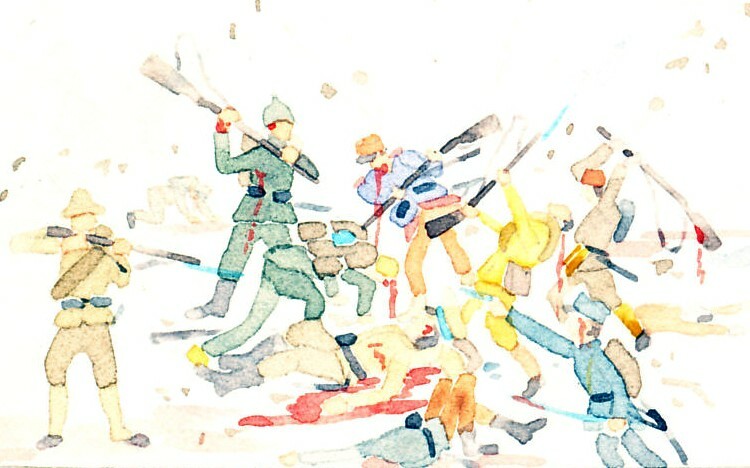 Here is shown the scene of the Irish rebellion which figures in the capture of Sir Roger Casement, who now faces trial for high treason and a possible sentence to death. With him on the same charge will be tried Daniel J. Bailey, the Irish soldier, who landed on the Irish coast with Casement from a German submarine. The date of the trial has not been set, but it will probably take place in the near future. 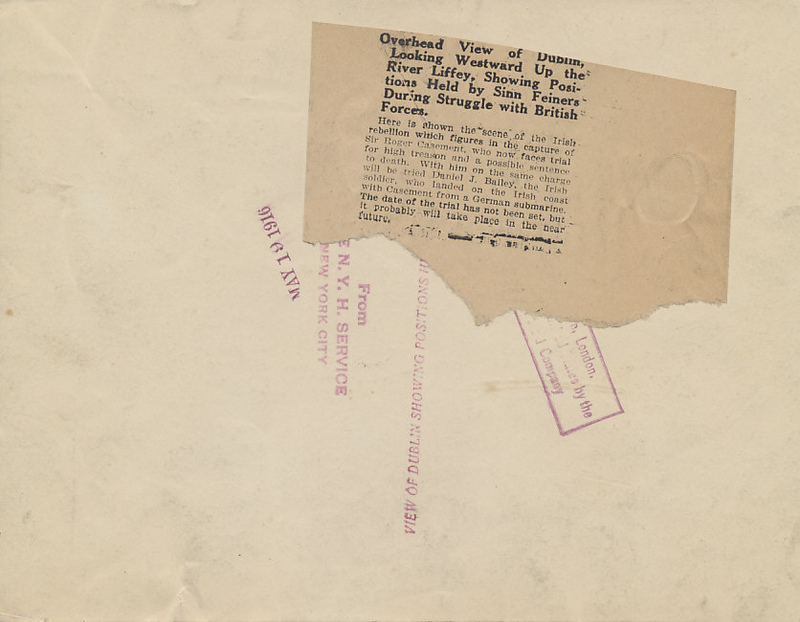 Stamped date: May 19, 1916. Stamp: View of Dublin showing positions . . .
Home Rule for Ireland had been thwarted in the late 19th century, but had been made all but inevitable by legislation in 1912. The Ulster Volunteer Force had formed in 1913 to prevent the imposition of Home Rule in Ulster, Ireland's north, vowing the use of force, and arming themselves to back their threat. The Irish Volunteers, a largely Catholic group, was a direct response, but was poorly armed. A new shipment of weapons including 20,000 rifles, ten machine guns, explosives, and a million rounds of ammunition from Germany went down with the ship bearing them when it was intercepted by the British and sunk by her German crew on April 22, 1916. Neither German troops, nor a unit of Irish soldiers formed from prisoners of war materialized. With the loss of these weapons, Eoin MacNeill, Chief of Staff of the Irish Volunteers, tried to prevent any insurrection by ordering that 'no parades, marches, or other movements of the Irish Volunteers' take place on Easter. Other Volunteers and the Irish Republican Brotherhood moved forward on Easter Monday, April 24, 1916, a quiet bank holiday. With them was the Irish Citizens Army, a militia formed by James Connolly and Jack White to protect trade union members in the aftermath of the seven-month long 1913 Dublin Lock-out. Mustering at points throughout Dublin at 10:00 AM, the rebels seized the General Post Office (GPO) and entrenched in St. Stephen's Green. At 12:25 PM, Patrick Pearse, addressing 'Irishmen and Irishwomen', proclaimed the establishment of the Irish Republic, reading a proclamation signed by Thomas Clarke, Seán Mac Diarmada, Thomas Macdonagh, Pearse himself, Eamonn Céannt, James Connolly, and Joseph Plunkett. With the GPO as its headquarters in central Dublin, the rebels also held Liberty Hall, Boland's Bakery to the east, Jacob's Biscuit Factory near St. Stephen's Green to the south, and the South Dublin Union to the west.